Bored of regular rotis for dinner? 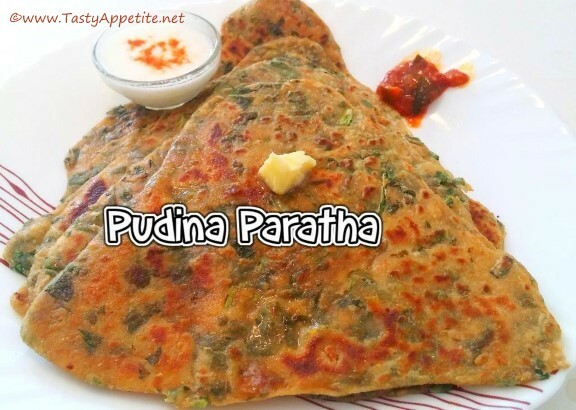 Here comes the flavorful restaurant style pudina paratha recipe that can be prepared at home quickly. This is a fantatic bread with an amazing taste & unique flavor of mint & coriander leaves. This crispy, flaky and layered paratha can be served with curd, raitha and any spicy curry. Check out this easy video recipe and enjoy your dinner or breakfast. Clean, wash and chop mint leaves and coriander leaves. In a mixing bowl, add wheat flour, salt, cumin, ginger garlic paste, chat masala pwd, mint leaves, coriander leaves, sliced green chilly, yoghurt, oil and knead well. Sprinkle water and knead to smooth soft dough. Divide the dough into equal sized balls. Take one ball, dust with flour and roll it to thin round disc. Fold the disc to half, smear with oil and fold to triangle as shown in the video. Dust with flour and roll it to triangle shape. Melt butter and place the mint paratha. Cook on hot flame until the paratha turns golden brown on both sides. Flip the paratha to both sides and remove from flame. Flavorful delicious restaurant style mint paratha is ready. Enjoy this hot crispy golden parathas with yoghurt & pickle.